MISERY INDEX is one well-oiled machine that consistently releases great albums. Its style of grindcore/crust-infused death metal is second to none and the quartet just keeps getting better, whether in the studio or on the stage. The last album, "Discordia" upped the ante with more dynamic songwriting, while retaining every last bit of ferocity, but "Traitors" makes an even bigger leap forward. The tracks on "Traitors" are considerably more varied and the songwriting more dynamic. After joining for the "Discordia" release, guitarist/vocalist Mark Kloeppel began making significant contributions to the songwriting and that continues on the new release, one defined by a truly collaborative effort by all the members and it shows. Looking only at the staggeringly violent manner in which the music is performed on a MISERY INDEX album, nary a fan would be disappointed with the results on "Traitors". The barking vocals from Kloeppel and bassist/main lyricist Jason Netherton continue to be among the most ferocious in extreme metal, made even more biting when one considers the astute sociopolitical commentary. The dueling guitars of Kloeppel and Sparky Voyles produce riffs that will sand the skin right off your face, interspersed with solos that rip through the air, while Adam Jarvis again proves that he's one of metal's most devastating drummers. But there is more to this album than remorseless destruction of the senses. A sense of melody is more apparent this time around, but not in a dominant kind of way. You'll hear it sections of songs like "Theocracy" and "Ghosts of Catalonia". The changeups are better too, as heard on "Partisans of Grief", which features some interesting axe interplay; one section includes a lighter picking counterpoint that gets your attention every time. The tune also happens to feature the guest vocals of THE RED CHORD's Guy Kozowyk, lending more depth to the track. Tomas Lindberg makes an appearance on "Ruling Class Cancelled" as well. Heck, there is even a shouted chorus on the title track. In another example, the pace slows — a relative rarity on a MISERY INDEX album — to a sinister grind on "Thrown into the Sun". 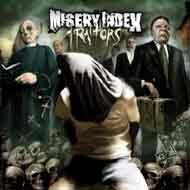 Getting right to the point, "Traitors" features the most individual track identity of any MISERY INDEX album yet. Then you've got Kurt Ballou's engineering/production, which puts more emphasis on the band's scathing sound. Wrap it all up with the superb album art, which is oh so fitting to the band's disdain for the current state of American politics, and "Traitors" ends up being a mandatory purchase for any fan of extreme music. MISERY INDEX is nearly untouchable.